The Final Touch Wine Scent and Flavor Enhancing Decanter answers the aerating question. Photo from Bed Bath & Beyond Web site. PEOPLE take note: No one needs more than two corkscrews. Full stop. A golf clubby snuggly to plug a wine bottle? Really? Are you 12? It’s called a vacuum cork. And as for that chiller on a sizzling summer day: if the bottle must be opened in order to insert some iced plastic gadget, then that white wine will age faster than a natural blonde on a beach. A wine lover will never use it. Beyond the one good corkscrew, a wine aficionado’s perfect gadget is a decanter. Far from being a frou-frou accoutrement (that’s French for “seriously prissy thingy”), decanters are imminently practical. In the past, unsophisticated bottling techniques made decanting essential. Natural sediments, which can make a wine bitter, mucked up most bottle bottoms. Sediments are less of a problem today, but there’s another lesser-known reason to decant: many wines need to open up in order for their fullest flavors to be revealed. That is why connoisseurs may recommend that a particular wine sit uncorked for a while (breathe) before serving. Oxygen reacts with the wine, aging it but also allowing it to mature gracefully. But how much oxygen can really react with wine if the bottle has just been opened? Not that much. The exposed surface area is about the size of that of a quarter. Professional tasters swirl wine in their glasses before sipping for this very reason. More oxygen needs to react with the wine. In essence, decanting is wine-swirling for a bottle of wine, instead of a glass. 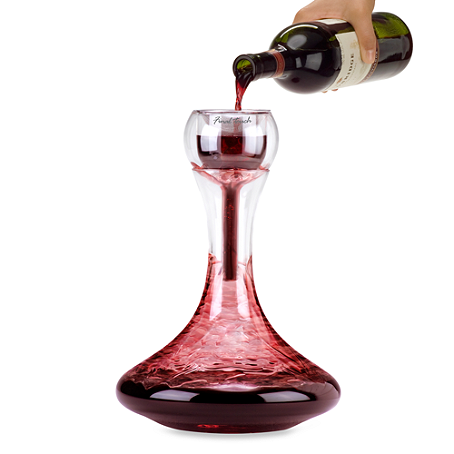 The Vino Wine Decanter is modern and minimalist. Photo from Pottery Barn Web site. In practical terms, a decanter is simply a glass vessel that exposes wine to air. No more, no less. The basic technique is simple: pour wine slowly and smoothly along the decanter’s interior until only the sediment remains in the bottle. Tilting the decanter helps. Tired of the coordination? Consider using an aerator, a wine glass with a hollow stem that sits atop a decanter. No need to hold both the bottle and the decanter at odd angles. The aerator does the work instead. What should be decanted? Well, the debate rages on and on. School of thumb: recently made robust red wines such as Barolo, Syrah and some exquisite Cabernet Sauvignon. Less robust red wines, such as Pinot Noir and Chianti, typically do not require decanting, but if a certain one produces serious mouth-puckering sensations (tannins), then by all means, pour pour pour. Elegance is etched into the Lismore Collection Decanter by Waterford. Photo from Crystal Classics Web site. 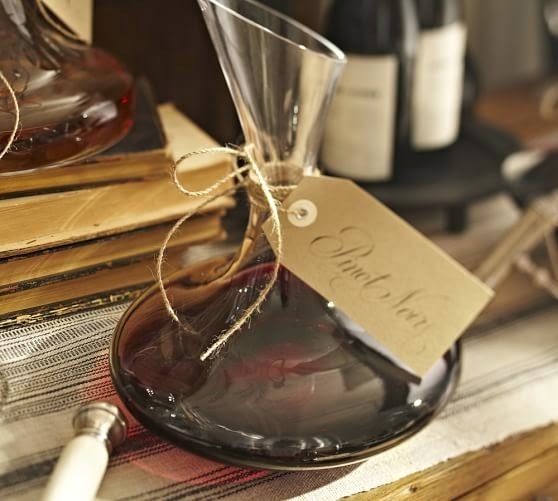 Some experts suggest decanting – how shall we put it? – value wines – to make them taste better, but the overexposure may actually make them taste worse. And don’t even think about decanting most white wines. Air kills them, rendering most flat and nasty. 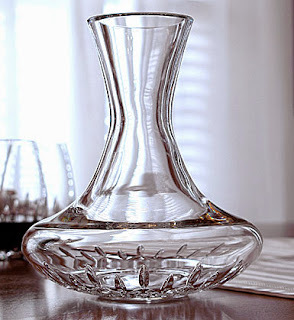 What should a decanter look like? Remember: all it has to do is expose wine to air. Anything else is a matter of taste and wallet-size.